Please get back with me if you would like me to send something over for your consideration. I have to admit that I was intrigued by this unusual mode of marketing: the sole desired reward is attention — a link to the website. Of course, the spam filter on this blog routinely removes many automatically-generated comments that attempt “stealing attention”, but this offer does not seem to be neither spam nor automatically generated and the offer for the “guest post” seems personalized enough so that real work was offered. What is being promoted seems to be a rather new web site and blog that intend to be a portal for online education/degrees — probably not useful for most of the audience of this blog — but still seems to contain some useful links to online material. I was impressed enough with the basic premise of this offer (as well as somewhat flattered by the suggestion that the attention that my blog can bring is worth something) that my response was to use the letter, with the links, directly as a blog post. So, Tara, if you’re actually reading this, a comment on your experience with this marketing effort would be appreciated. The schedule of the ad auctions workshop has just been published. The schedule of the workshop on The Economics of Networks, Systems, and Computation has not yet been published too now yet. The workshops are taking place on July 6th and 7th, respectively, as part of EC 2009 in Stanford. Budgets: It is very common for an advertiser to have a budget limit for the total expenditure over all auctions in a certain period. This raises many questions, both game-theoretic and algorithmic, from the bidder’s point of view as well as from the auctioneer’s point of view. The basic paper addressing the algorithmic problem of the auctioneer due to Aranyak Mehta, Amin Saberi, Umesh Vazirani, and Vijay Vazirani presents an online algorithm with a worst case competitive ratio of 1-1/e. Many variants of the model have been considered in the literature, but the 1-1/e ratio has been hard to beat. The EC’09 paper “The Adwords Problem: Online Keyword Matching with Budgeted Bidders under Random Permutations” by Nikhil Devanur and Thomas Hayes does so getting a approximation by adding a distributional assumption to model. Reservations: Advertisers often wish to “reserve” a certain number of impressions of some target type in advance. If this has been done, then once the stream of impressions arrives, then the reserved number of impressions should be delivered sometime during the agreed-upon period (with some penalty if the reservation cannot be fulfilled.) There are challenges during reservation time (can the auctioneer commit to a requested reservation? how to price it?) as well as during delivery time (which reservation should the current impression fulfill?). The EC’09 paper “Selling Ad Campaigns: Online Algorithms with Cancellations” by Moshe Babaioff, Jason Hartline, and Robert Kleinberg studies the added flexibility that the auctioneer gets if he is allowed to renege on past reservations, for a cancellation fee. Learning: Most ad auctions have a pay-per-click rule: the bidders pay for the impression that they won only if the ad was “clicked” by the user. This means that the “real bid” to be considered depends on the “click through rate” — the probability that the ad will be clicked — a random variable that depends on the impression and on the advertiser. These click through rates can be learned throughout the stream of auctions, and then taken into account in future auctions. Non-strategic analysis of similar situations often falls under the name of multi-arm bandit problems, and two closely related papers in EC’09 take into account the strategic behavior of the bidders: “Characterizing Truthful Multi-Armed Bandit Mechanisms” by Moshe Babaioff, Yogeshwer Sharma, and Aleksandrs Slivkins and “The Price of Truthfulness for Pay-Per-Click Auctions” by Nikhil Devanur and Sham Kakade. 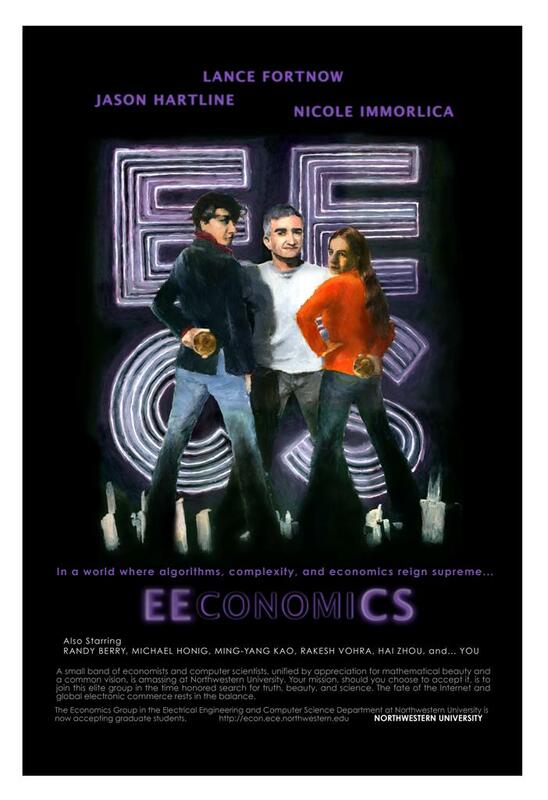 Jeff Ely, an Economics Professor in Northwestern, has recently been publishing on his blog some notes as well as slides from his intermediate micro-economics course. These seem to be quite helpful to me for bridging the “narrative-gap” for two main reasons. First, as Jeff explains, the organization of the course is not the classical one for teaching micro-economics but rather his unique “institution-free approach”. So far he has published notes for the first 3 lectures and I find this approach to blend very well with the CS-ey point of view. (Is this somehow related to the strong cs-econ group in Northwestern?) Second, the lecture slides are presented within his own ars-economic commentary about what he teaches, which I find even more fascinating. These lectures are probably not the right place for a computer scientist to learn micro-economics, as the slides are rather high-level and miss much detail. Being an intermediate course, their mathematical level would also likely be too low for the taste of most CS or Math students. Yet, as a vehicle for getting some feel for the “mind of an economist” they seem excellent. A recently announced new conference named “Innovations in Computer Science (ICS)” is drawing much attention and debate in the Theory of CS blogosphere (e.g. here, here, here, here, and here). The aspect that I found most interesting has not been discussed though: the new conference is in Beijing. I find the seriousness with which the community is discussing a non-North-American conference to be an interesting indication that the times are a changing. There has even been discussion whether the best “conceptual papers” will be sent to ICS or to the leading prestigious conferences FOCS and STOC. This is still just talk, but even such talk is quite an accomplishment for a conference that has not been born yet. This seems to be another indication that China is starting to take its place in the innovative forefront of science, in this case theoretical computer science. Specifically, the ICS conference is being sponsored by the Institute of Theoretical Computer Science at Tsinghua University that has gained significant visibility in the last few years. Led by Turing award winner Andy Yao, supported by a distinguished international “chair professor team“, hosting an amazingly strong stream of visitors, recruiting top students, and, it seems, amply funded, the institute has certainly gained much attention very quickly. Their goals of scientific excellence seems quite clear from the slides of a talk on “Nurturing Talents in China” that Andy Yao gave last year. The current “killer application” for algorithmic game theory is certainly on-line advertising. The traditional advertising industry is undergoing great turmoil due to this on-line advertising as well as other technological changes which may not only give viewers more relevant and less annoying ads, but also may start addressing the main problem from the point of view of advertisers, captured by the famous quote “Half the money I spend on advertising is wasted; the trouble is I don’t know which half”. This highly entertaining video is from the point of view of traditional advertising (thanks to Eyal Manor for the link). A Workshop on “Search, Mechanism Design and the Internet” will be held in London on June 12-13. (As noted on Haris-Aziz’s blog.) Some of the presented papers can be found here.